Although the nervous impulse is accompanied by effects that can under specially favourable conditions be detected with radioactive tracers, or by optical and thermal techniques, electrical recording methods normally provide much the most sensitive and convenient approach. A brief account is therefore necessary of some of the technical problems that arise in making good measurements both of steady electrical potentials and rapidly changing ones. In order to record the potential difference between two points, electrodes connected to a suitable amplifier and recording system must be placed at each of them. If the investigation is only concerned with action potentials, fine platinum or tungsten wires can serve as electrodes, but any bare metal surface has the disadvantage of becoming polarized by the passage of electric current into or out of the solution with which it is in contact. When, therefore, the magnitude of the steady potential at the electrode tip is to be measured, non-polarizable or reversible electrodes must be used, for which the unavoidable contact potential between the metal and the solution is both small and constant. The simplest type of reversible electrode is provided by coating a silver wire electrolytically with silver chloride, but for the most accurate measurements calomel (mercury/mercuric chloride) half-cells are best employed. Fig. 2.1. Methods for measuring absolute values of resting potential and action potential: a, longitudinal insertion of 50 |m internal electrode into a squid giant axon; b, transverse insertion of 0.5 |m internal electrode used for recording from muscle fibres and other cells. From Hodgkin (1951). through a cannula tied into the cut end (Fig. 2.1 a), but this method cannot be applied universally. For tackling cells other than giant axons, glass microelec-trodes are made by taking hard glass tubing about 2 mm in diameter and drawing down a short section to produce a tapered micropipette less than 0.5 |m across at the tip (Fig. 2.1 b). The microelectrode is then filled with 3 m KCl, and an Ag/AgCl electrode is inserted at the wide end. With various refinements, microelectrodes of this type have been used for direct measurement of the membrane potential not only in single neurons but also in many other types of cell. the details of the signals can be examined at leisure. To obtain a permanent record, the picture on the screen may be photographed. Direct-writing recorders yielding a continuous record on a reel of paper are convenient for some purposes, but cannot generally follow high frequencies well enough to reproduce individual action potentials with acceptable fidelity. A recent development for experiments involving close examination of the time course of the signals is to convert them into digital form, and to use an on-line computer both for storage and analysis of the data (Figs. 4.12, 4.13). A technique that since its introduction by Hodgkin and Huxley in 1949 has played an ever more important role in investigations of the mechanism of excitability in nerve and muscle is voltage-clamping. 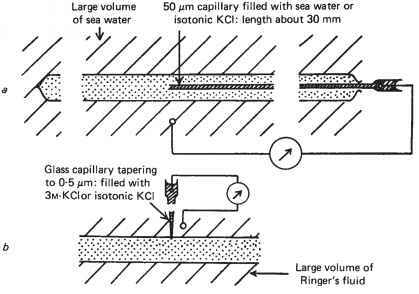 Its object, as explained on p. 50, is to enable the experimenter to explore the relationship between the potential difference across the membrane and its permeability to Na+ and K+ ions, by clamping the membrane potential at a predetermined level and then measuring the changes in membrane current resulting from imposition of a voltage step. 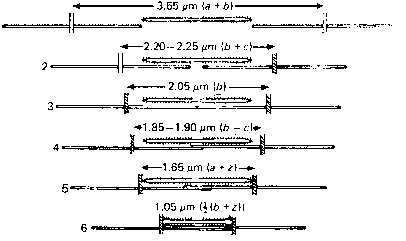 As shown diagrammatically in Fig. 4.6, it necessitates the introduction of two electrodes into the axon, one of which monitors the membrane potential in the usual way, while the other is connected to the output of a feedback amplifier that produces just sufficient current to hold the potential at the desired value. The internal electrode system used by Hodgkin and Huxley was a double spiral of chloride-coated silver wire wound on a fine glass rod (Fig. 2.2), but others have used a glass microcapillary as the voltage electrode, to which is glued an Ag/AgCl or platinized platinum wire to carry the current. In order to voltage-clamp the node of Ranvier in a single myelinated fibre dissected from a frog nerve, an entirely different electrode system is required, but the basic principle is the same.